In this article we will learn How to convert multiple rows into a single row with comma separated value? 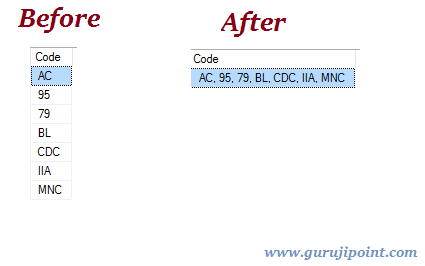 Convert multiple row into single row data in Sql with separator?Convert many rows into a single text string. In previous articles we have learnt what is TypeScript and How to Install this on VS2015 .AngularJS basics,. Best basic C# interview questions. What is Cursor in sql and use of cursor. In many situation you need to convert or display or reverse your multiple rows data into a single row string . It is very easy using Stuff and XML path in SQL server. Now we need to Convert or Transform all the Rows of Code into a Single comma separated Code . You can use your own separator by replacing comma in the above solution.